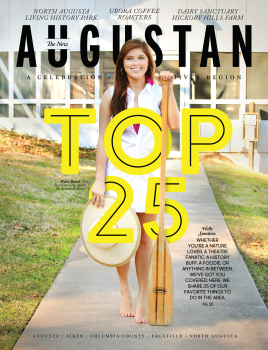 Augusta’s River Region has all the flavors of the South with a growing culture of artists, foodies, athletes, adventurers, historians, and families – and it’s all the things a Southerner should be. Laid-back. Welcoming. And a little bit quirky. Beyond the city of Augusta lies a larger and more diverse area we refer to as Augusta’s River Region, which encompasses the Savannah River and the neighboring cities including Augusta, Aiken, Columbia County, Edgefield and North Augusta. This region has all the flavors of the south with a growing culture of artists, foodies, athletes, adventurers, historians, and families. And it’s all the things a Southerner should be: laid-back, welcoming and a little bit quirky. Augusta’s River Region includes areas of Georgia and South Carolina, so you can experience everything from horse racing to barhopping, from touching textiles to kayaking along the region’s waterways. You could easily spend a day outdoors hiking or biking miles of trails, and another day enjoying signature brews and cocktails and picturesque downtowns. At the end of your trip, memorialize it by purchasing a bottle of Fruitland Augusta Vodka, which encapsulates two of the things this area is known for: peaches and incredible specialty drink creations. When most people think of Augusta, they think James Brown and the Masters® Golf Tournament. But, if you look past the city limits, the soul music, and the golf tournament, you’ll find a diverse region of adventures and tastemakers calling you to come on over.